September 29, 2015 – Kaysville and Farmington, Utah are working to develop an active transportation (bicycling and walking) master plan. The plans will be separate for each city, but will connect on the shared boundary between them. The finished plan is expected by March 2016. This planning effort will develop joint policies and design standards, forming two unique and separate plans for both Kaysville and Farmington that will be unified in purpose and objectives. The plans will connect along the shared city boundary, but each will address needs specific to each community. The survey is open through Wednesday, September 30, 2015. Additionally, there will be a plan open house held on December 8, 2015 at the new Kaysville Library at 215 N Fairfield Rd, Kaysville. 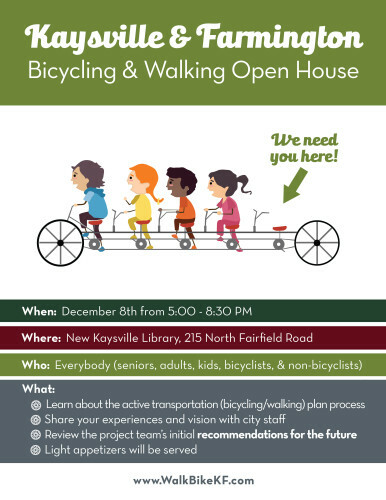 Kaysville and Farmington Bicycle Master Plan Open House to be held on December 8, 2015.